After I publish changes and hit the facebook share, it just sits there with the circle going around and around and never posts to facebook. This has been mentioned a few times recently and I haven't come across a reply from Yola. I don't know if this is a Facebook issue or a Yola issue. I hope that you are able to get an answer from Yola on this. That suggests then that it's not a FB issue. This forum is a different system going through Get Satisfaction so the Facebook side looks as if it's functioning. Went into facebook "apps" settings in my account. 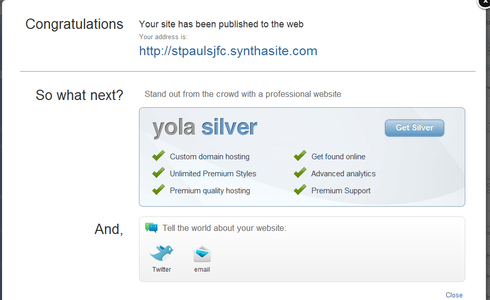 Found and deleted the yola reference thinking that next time I published it would prompt me to redo it. No joy. This suggests even more so that there is an issue with the Yola side of the communication. It should re-prompt you but if the message isn't getting through then I guess that seals it? I am sorry you are having this problem. We have seen a few cases like this but we are struggling to pin it down. Can you please tell us what browser and version your are using? Can you also please try a different browser and see if that helps. Using latest version of chrome. Will try in IE. Worked in Chrome before. Still not working in Chrome or IE8. Sanja has just reported that there is a bug with the FB facility in IE and it doesn't work. This has just come to light. We are currently experiencing a problem with Facebook updates. Our engineers have been notified and are working on fixing the problem. We will let you know as soon as the bug has been fixed. Apologies for the inconvenience during this time. When I publish my site and want to post it on facebook, it just gets stuck spinning around now. It never gives the confirmation message anymore and it never posts. stuck on facebook update message after publishing updates on site. Can't seem to do it have tried Safari and Firefox both just has cogs going round and around!! looked at the quick fix answers and have not got the app Yola on my facebook to delete and start again. can not post updates to facebook. I have tried for months to update my site to facebook, it won't work. It used to work? Not now? I have tried to publish and unpublish my site...I have tried to remove the app on my facebook and re add it. Still it won't work? :( Please help. No matter what I try I cannot get my website to update to facebook. For all just received this and it did not work!! BTW twitter does work and has not got the same email address I use a log on name!! Thank you for contacting the Yola support team. In order to successfully publish to your Facebook or Twitter account, your Yola login email needs to be the same as your Facebook and Twitter login email address. Log into your account as usual. Click on "Profile" in the left-hand menu (you will find it under "Account"). Delete the old email address and type in the new one next to "Email". Click on the "Change details" button to update your information. A message will display to confirm that your information has been successfully updated. Once you have done this you will be able to log into your account with your new email address. Please don't hesitate to contact us if you have any further questions. Remember, we are here to help. I can't seam to post my website content to Facebook. The cog just keeps on going round and round with the words saying "Posting to Facebook". Yola have a bug with their Facebook app and working on a fix. They will notify us when all is working again. I have always had the same login email for both. I would like to send website updates to Facebook and the Help says that when you publish it will have links down the bottom saying update Facebook and Twitter. However I can only see Twitter and email links, no Facebook. Do you know why this is? I can't find the update facebook feature when I publish the website. Please note that the Facebook update button in the Publishing dialogue box has been temporarily removed until the problem is sorted. Thanks for your understanding and our apologies for any inconvenience. How do I make the share on facebook option appear after I make changes to my site? I get an option to share the news via email and twitter but not facebook. How do I make the share on facebook option appear?.